Today's dynamic executives are driven by the speed of execution. They need tools to supplement business control functions. 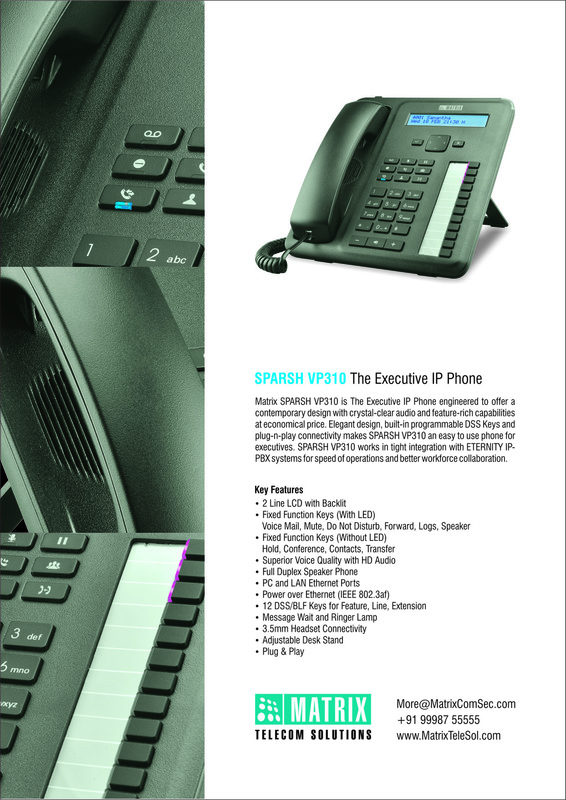 Matrix presents SPARSH VP310E – a New Age Smart IP Phone for today's dynamic business executives. SPARSH VP310E collaborates with VOIP Phone System to provide a rich experience of office telephony and advance call management features. SPARSH VP310E provides HD voice for office communication with all enterprise grade features on the fingertips of the executives making it the perfect VOIP telephone handset. The phone provides corporate directory integration, DSS keys, fixed function keys, LCD with Backlit and many such features, making it much easier for executives to reach out to people and maintain business continuity. SPARSH VP310E is designed to offer reliable communication solution and collaborative business experience. Crystal-clear Audio, intelligently designed Button Layout, DSS Keys and Plug-n-Play Connectivity makes SPARSH VP310E an ideal choice for business executives. SPARSH VP310 works in tight integration with ETERNITY IP-PBX system for speed of operations and streamlined communications.